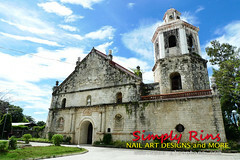 I attended the Visayas Blogging Summit 2010 last weekend with friends at Iloilo City, Philippines. I couldn't go without a nail art, right? I was having a hard time deciding on the design but I definitely wanted something cute. I ended up doing a Tweety nail art design! Base colors are Orly Charged Up and OPI Do You Lilac It for the accent nails. Both in 2 coatings. Easy application and opaque in 2 layers. A monochromatic theme for the base colors. 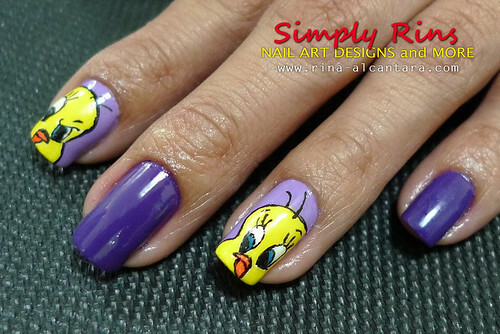 Again, I left the other nails plain for the Tweety nail design to pop up. I used Elianto Yellow for coloring Tweety over white acrylic base. 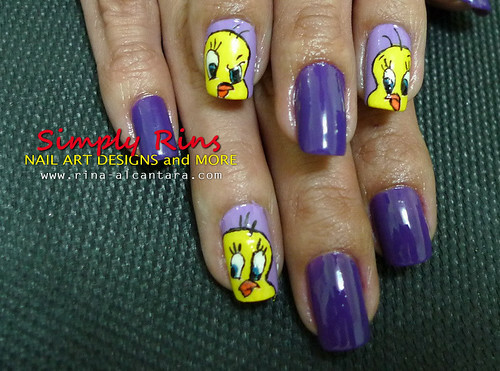 Here's my Tweety nail art during the Visayas Blogging Summit. 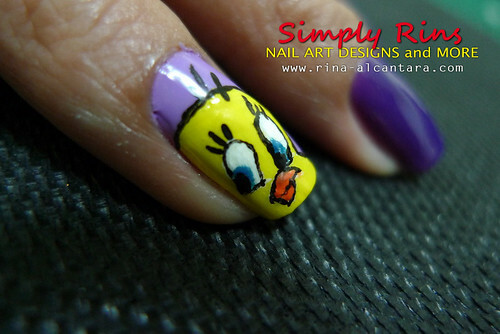 I wanted to draw Sylvester but I think Tweety is too cute to have a rival on my nails. But this one will go on my list after my December project to post Christmas nail art designs. A shot from our hotel room. 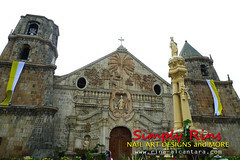 The last day of the summit was allotted for a tour of Iloilo City. 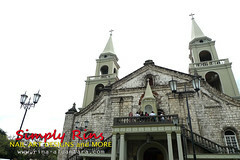 The culture, the food, and the people were great but I'm most fascinated by the old Churches that we visited. I prayed and made a wish in each of them. I ate crabs and shrimps with my hands during the Iloilo tour and that caused some nail polish chipping so I removed my nail art when we got back to the hotel. Sigh. You certainly are an artist. Jealous. Boy, really nice. you really got talent. clear, clean well defined. Very cute! I love the colour combo of purples and yellow. 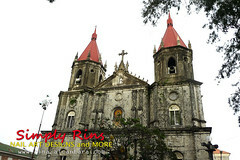 And those churches are gorgeous! My city (Adelaide, Australia) is actually known as The City of Churches so I have a thing for beautiful church architecture. Looking forward to seeing your Christmas nail art! Now that it's December I was thinking of writing out a plan for what art I'm going to do, and no doubt your posts will inspire me. galing talaga wweeeee! I so love tweety!!! To Danielle, I hope I'll be able to visit Australia so I can see the Churches you mentioned. I broke a nail last weekend and I'm letting it grow a little before I start my Christmas nail designs. :) I'm sure you'll have great ideas. OMG I love Tweetie! "I tawt I taw a puddy tat. I DID I DID I DID!". Great job and great use of complimentary colours! !